Waterfit and lime in the water: better than chemical descaling systems. Enjoy drinking water finally! With Waterfit hard water or lime in the water is no longer a problem. Waterfit increases the living comfort ! Faster and easier cleaning ! Waterfit. Water can be so good ! Waterfit. Reliable. Sustainable. Ecological. Without any following costs. Waterfit, the successful and internationally awarded lime converter without electricity, without electromagnetic pollution, without electric smog, without chemicals, without salt, without dissimilar taste, without maintenance, without maintenance costs and without any follow-up costs. Waterfit stands for minimization of lime deposits and physical protection against lime deposits. Waterfit dismantles existing lime deposits as well. Waterfit can be installed easily and quickly into your water system. with Waterfit it is not necessary to soften the hard water: please find the many advantages of lime conversion in detail below. maintenance-free and without any following costs ! Water hardness is a measure of the lime content of water. Calcium and magnesium salts are responsible for hardness, which is expressed as degrees of hardness. One German degree of hardness (1°dH) = 10 mg calcium oxide per litre of water. One German degree of hardness (1°dH) = 10 g calcium oxide per m³ (= 1.000 litres) of water. Hard water is not a sign of low drinking water quality, indeed the contrary is true. The harder the water, the greater the formation of scale in hot-water boilers. impairs the efficacy of soap-based cleansing agents. What can be done against hard water ? The classical descaling plant removes and replaces the calcium and magnesium ions, which are responsible for the hardness, by others. In principle, the ion exchanger consists of a container that is filled with fine plastic grains (excanger resin). These grains are enriched with a saline solution. Over this enriched excanger resin the hard water is passed and will be (in part) softened. To avoid the formation of rust, usually phosphate has to be used for water softening. Another disadvantage is that instead of calcium and magnesium ions, sodium ions enter into the water. That can affect the taste quality of aromatic beverages such as coffee, tea etc. While for circulation damaged persons complications as a result of the fault of the physiologically important sodium-calcium balance in the body cannot be ruled out. Also, the hygienic quality of water by seed increasing in the exchanger resin can deteriorate. 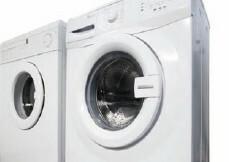 What else can be done against hard water ? That magnetization of water helps to remove lime deposits is indisputable in the professional world. A magnetic field that acts on running water changes the physico-chemical properties. 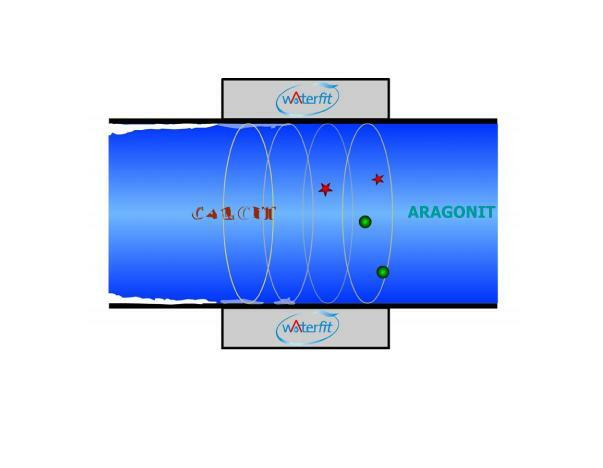 In the path taken by the water through the Waterfit appliance, beside the swirling and the frequency technology there is a special magnetic technology which transforms the larger calcite crystals into smaller aragonite crystals which are another form of lime. These aragonite crystals can link hardly on the water pipes, are kept in balance and again washed out from the water supply. The water quality will be optimized with Waterfit, the original water hardness degree, typically measured in degrees of German hardness, remains unchanged. Because of forwarding the water at revitalized water and special frequency technology the water molecules get information = vibrations = energy which means that the water quality escaping from the Waterfit device is approaching to a spring source water quality. Enjoy energized water and do something good to yourself and the environment. that the water quality has improved technically and biologically. Many of our satisfied customers speak of a “pleasanter, softer-tasting water” whether drunk by itself, mixed with fruit juice or wine, or used to make coffee or tea, etc.